When we buy those things at the local burger store or chain supermarket we get mostly what we expect. The public is well versed in whats in industrial food–things like additives, drugs, antibiotics, hormones, preservatives. Honey for sale in a Virginia food products store in Roanoke, Virginia. Food Safety News points out that in America these days, not even honey is all its cracked up to be. Importers and wholesales of what is thought of as one of the most wholesome food products on earth are squeezing the life out of honey. Processors say its because US consumers want a crystal clear product. But critics point out that ultra filtration of honey…and dilution with non-honey ingredients…lets importers blend profitable products from around the world. No one is the wiser because filtration erases genetic and biological fingerprints that could reveal country of origin. If its true consumers prefer their honey that way, then for big food, that’s a very convenient truth. Now a lot of our honey comes from places like China where food standards and inspection are lax or non-existent even though food contamination is rampant. If you think honey filtering is bad you’re right, because its a corporate tool for filtering out important and relevant information about your food that can affect personal health and well being. Consumer choice is the price we pay for buying off the shelf. At first glance filtering might seem like a good idea, a way to remove contaminants. The trouble with that thinking is that the contaminants in many cases are good things; plant pollen that helps make people immune to allergic reactions, (think hay-fever) and evidence of the pollen packing bees who made it. (Pollen and DNA in honey both reveal where the product came from.) But while removing genetic information of when it was created and where, filtration does nothing to change the presence of bad things in food like antibiotics and dangerous chemicals. Almost all the organic honey sold in the United States comes from Brazil. 60% of all the other honey consumed here comes from Asia. Its been said that in many cases wary consumers would have more luck deciphering state secrets than finding out where their honey came from. Unlike honey, most (but not all) dairy products sold in the United States are of US origin. 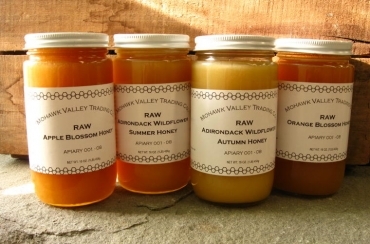 More and more those products are starting to resemble honey in that they are blended and refined to the point they could be anything coming from anywhere. That’s something that happens in our food more and more. Left photo by Richard Oswald. Right photo by Ben Fant/Memphis Commercial Appeal Left: Organic Valley’s ultra-pasteurized milk. Right: West Wind Farms sells raw milk every Saturday at the Memphis Farmers Market. Tennessee’s largest producer of raw milk, it turns out more than 250 gallons a week. Small dairy farmers able to market raw unrefined milk directly to consumers and ultra-pasteurized organic milk seem almost like direct opposites. The one thing both locally grown raw milk and organic milk have in common is that they take health conscious consumer preference into consideration by being chemical and antibiotic free. I’ve eaten honey straight from the comb, and I’ve drunk milk right from the cow. Generally speaking the closer you are to the source of your food, the safer and fresher food is. That’s the way it used to be for me. But lately I’ve also used ultra pasteurized organic milk purchased from a chain store grocer. Overlooking the source, its really an amazing product that keeps for what seems like forever when compared to standard pasteurized milk. The last gallon of standard Big Dairy milk I bought soured before I ever got round to opening it. That’s why it was the last gallon of Big Dairy milk I’ve bought. Its also one reason why I have to smile when I hear or read that drug free, antibiotic free organic offers no benefits to the consuming public, or that raw milk from the local family dairy is dangerous. The reasons food is packaged the way it is with so many treatments and preservatives is because the average American meal, blended from many different sources, may travel thousands of miles before arriving at your plate. What started out as a food system designed to bring seasonal products to consumers regardless of what time of year it was has become an industrialists paradise. The farther we go to get food the more concentrated industrial food power becomes and the less visible the actual source is. Animals are fed unnatural feed. Foreign ships unload bulk commodities shrunk to a individual ounces and sold in carefully designed packaging for 10 times the original cost. Something that started out as one thing is colored and treated to taste and look like something else. The more something is blended the less clean it is. Chemical treatments make up for lack of quality and safety. We kill our bees with GMO grain sold around the world and protect patent holders of that grain from law suits for the damage they do. We replace the honey we can no longer produce, with imports from China. We destroy domestic dairy prices so that cheap milk products from Europe can be bought in bulk and sold here at a profit. We move families off the farm, move the farms farther away, and concentrate them in the hands of corporations so the public wont see what they do. Then we pass laws to make poor judgement (something ethics used to prevent), bad animal husbandry, and food ingredient laundering across borders legal even to the point of giving it preferential treatment. A new book, Pandoras Lunchbox (6), is full of details about factory food. It all boils down to the fact that even after reading lengthy ingredient lists, its hard to know for sure whats really inside. It all boils down to the fact that if nothing changes, you may never know the real identity of the corporations that manufactured your food or what it really is, let alone the farmers who made it.